We flew direct from LAX – Narita. Normally I would avoid LAX like the plague, but I pounced on a cheap ticket for Singapore Airlines, which I have heard has won top accolades for customer service 24 of the last 25 years for all airlines (I couldn’t find evidence to back up this claim, but here is one favorable review). I had been planning a year in advance and it paid off. I was able to get round trip tickets, direct from LAX – NRT for under US$1000 each including all taxes and fees (buying them 9 months in advance). Most other tickets ran at least $200-500 more. We did have to get ourselves to LAX – the only direct flights on Singapore to Tokyo are via LAX. June, 2016 Update: Although one can save a lot of money on tickets by purchasing them many months in advance, you can run the risk of having your plans impacted should the airline change schedules. Awaiting our November, 2016 trip, Singapore Airlines notified us that their LAX – NRT flight times have changed – over 5 hours earlier! This requires us to change our domestic connecting flight, and we’ll have to fly the evening early and spend an overnight near LAX. We still come out ahead, but this is one possible drawback about purchasing your tickets so far in advance. If we were to cancel and rebook new tickets, our price would be US$400-500 more per ticket. Getting through LAX was the nightmare one would expect. Long lines, narrow sidewalks barely wide enough for a single luggage trolley, seemingly endless construction and overburdened rest rooms – that is, prior to going through passport control. Once we’d navigated past immigration and entered the international concourse, it was like we were in another world. Clean, modern and spacious walkways, well-dressed and well-mannered people of all shapes and colors speaking many different languages strolled past modern and pristine boutiques. And the bathrooms were clean and lightly trafficked. 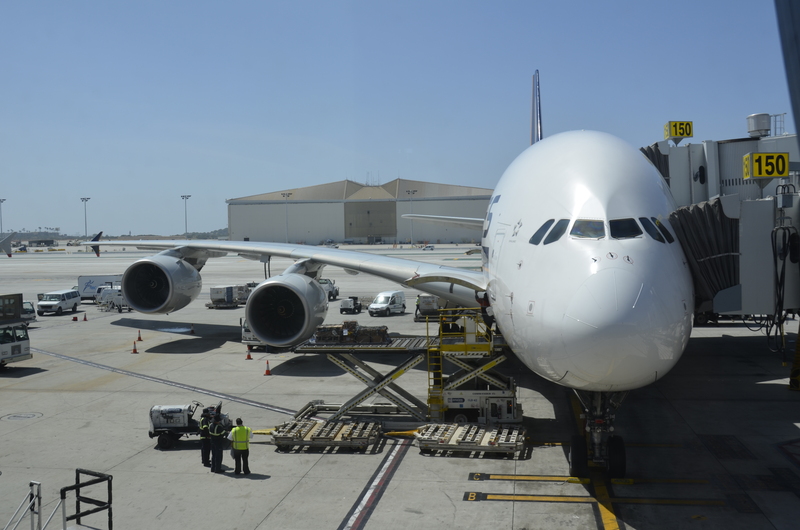 The Singapore flight was on the largest commercial aircraft in use today: the Airbus A380-800. Boarding went smoothly and quickly as there are multiple entries and the plane has two floors. So rather than a single, clogged gangway for passengers, they are able to board three separate lines at the same time. On board, there is ample headroom. Most airplanes I have been one have such low ceilings that there is no point in standing up unless you are on the aisle. If memory serves, I could stand up my over 6′ height even at a window seat. As the flight attendants were diminutive in stature, some barely could reach the overhead compartments to close the covers much less assist passengers in placing items overhead. The trick was there are little stirrup steps attached to the seat that they were able to use. I happily assisted some of my neighbors in stowing their bags. Since Singapore allows you two checked bags, people didn’t carry everything on board, and there was no trouble finding room overhead for our bags. Consequently, the underseat area wasn’t stuffed and I had space to stretch my legs, a precious option for an 11.5 hour flight. 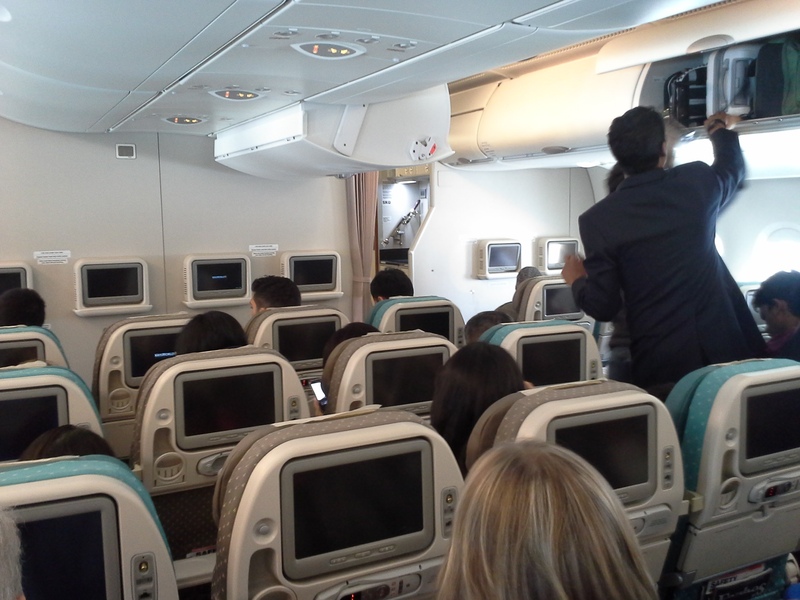 Before, my best airline experience had been Asiana Airlines three years previous, but SIA raised the bar much higher. Young, attractive, polite, and ever attentive male and female flight attendants served us excellent food, salmon with teriyaki sauce, cold noodles with dipping sauce, ice cream, complimentary drinks (I stuck to water and juice). Every seat in economy class had its own screen and we got free in-flight movies (I watched Selma, Interstellar, and three episodes of The Wire). No charges for anything except if I wanted in-flight Wifi, which I didn’t. There was plenty of room (even in economy class). 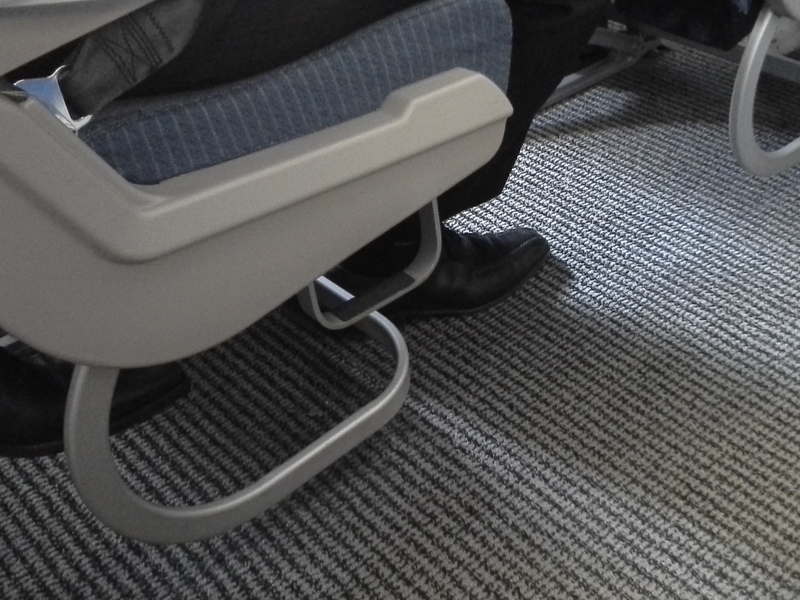 I am over 6′ tall and on most domestic carriers my knees touch the seat in front of me the moment the person in front of me tilts his or her seat, even a little bit. Even with the person in front of me fully reclined, I never made contact with their seat. Even the toilets, though not spacious, were at least 50% larger than any I’ve seen on domestic flights and were surprisingly clean. Indeed, flying Singapore Airlines reminded me of the “good old days” when flying was fun, exciting, maybe even glamorous. We landed at Narita a little ahead of schedule around 7:20pm local time arrival. Like boarding, deplaning went surprisingly fast. More surprising was how fast we made it through all the usual gantlets one normally has to navigate before being free to move around the destination country. Stepping off the plane, going through immigration, retrieving our checked bags, going through customs, and finally getting out to the curb for for ground transportation took less than 45 minutes total. Maybe it was a light-traffic, coincidentally high-staffed time? No, our departure a month later was just as smooth. Contrast that to LAX, where we waited over 45 minutes in one line alone to get our passports checked. 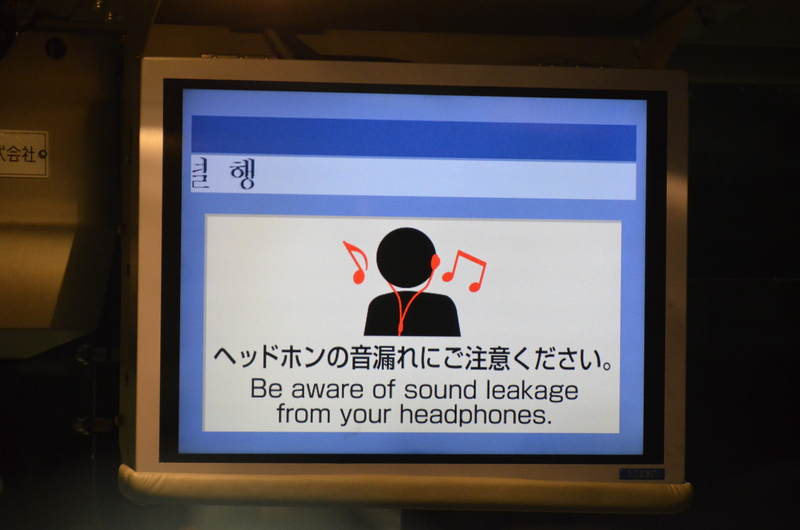 Narita Airport is quite a distance east of Tokyo, and unless your Tok yo destination is close to a subway or bus hub, one can expect to navigate a dizzying sequence of trains, subways, and buses – not a good option after a long flight and loaded with heavy bags. Luckily we had planned to forgo Tokyo at this point and go straight to Yokohama the night of our arrival. As previously instructed by our hosts, we caught the YCAT bus for Yokohama. It was a 1.5 hour ride costing adults 3600 yen and seniors (must show your passport) just 2000 yen. I enjoyed my first example of funny English on the bus. 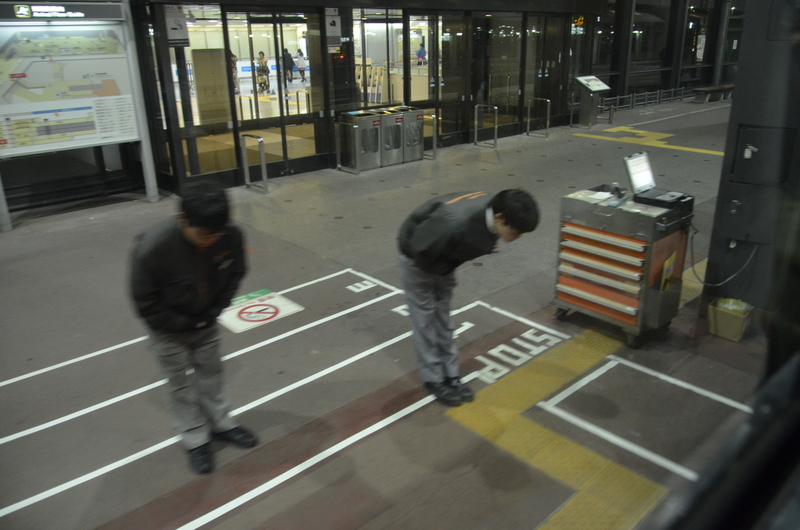 We arrived safely at the Yokohama YCAT station, and our hosts were there to greet us. A short drive away packed with our bags into a small car, we arrived. 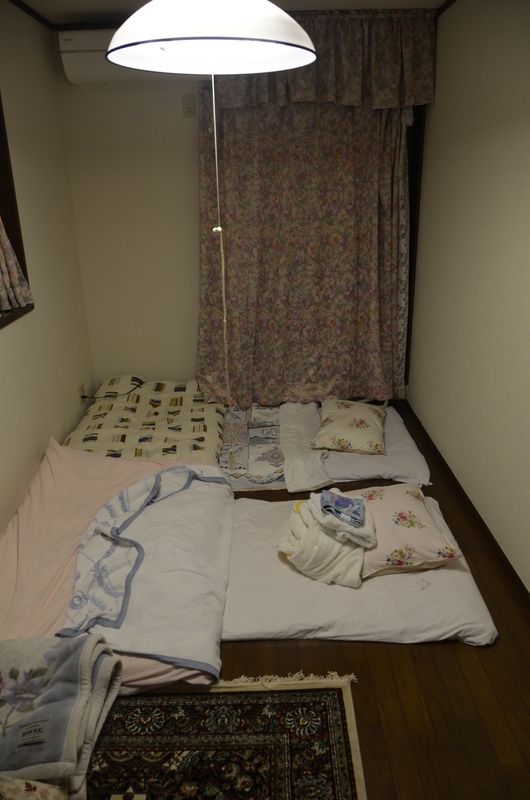 After a very long day (waking at around 4am Pacific time) we slept soundly in our traditional futon on the floor. A recent article just named Singapore Airlines as the second cleanest airline in the world (behind EVA Air out of Taiwan).